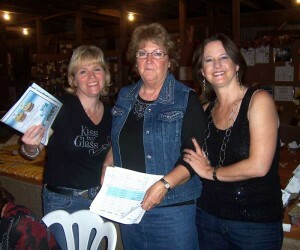 Danielle Chamberlain, Bonnie Musser and Denim & Diamonds co-chair, Liz Brown enjoy a moment during Thursday night's dinner event. “It takes a village…to make a party!” according to Alison Frey, along with Liz Brown and Berta Raines, Denim and Diamonds co-chairs. The third annual fundraiser dinner, held last Thursday evening at the Red Barn on the grounds behind Landhope Farms, went off without a “hitch” and ended up raising thousands of dollars to help support the Unionville Community Fair. 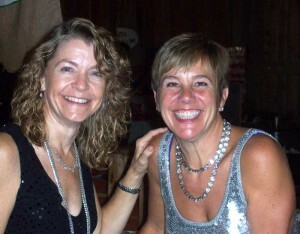 Carol Apicella and Denim & Diamonds co-chair, Alison Frey. 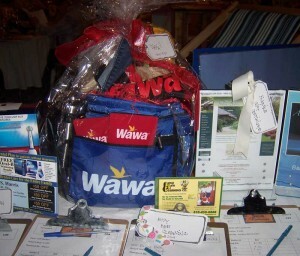 Silent auction items on display during the Denin & Diamonds event, kicking off the Unionville Fair. About 80 guests dined among more than 3500 exhibit entries and were the first to view the 2011 blue ribbon winners.